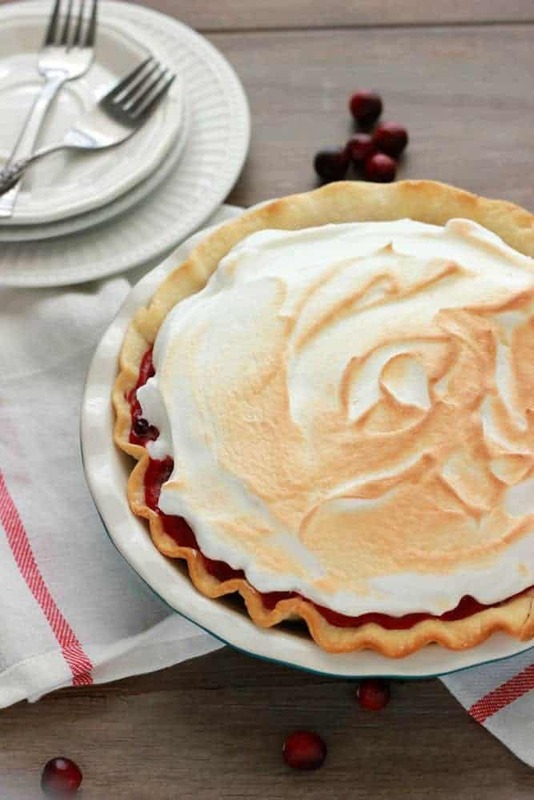 Cranberry Meringue Pie. Thanksgiving is just around the corner. 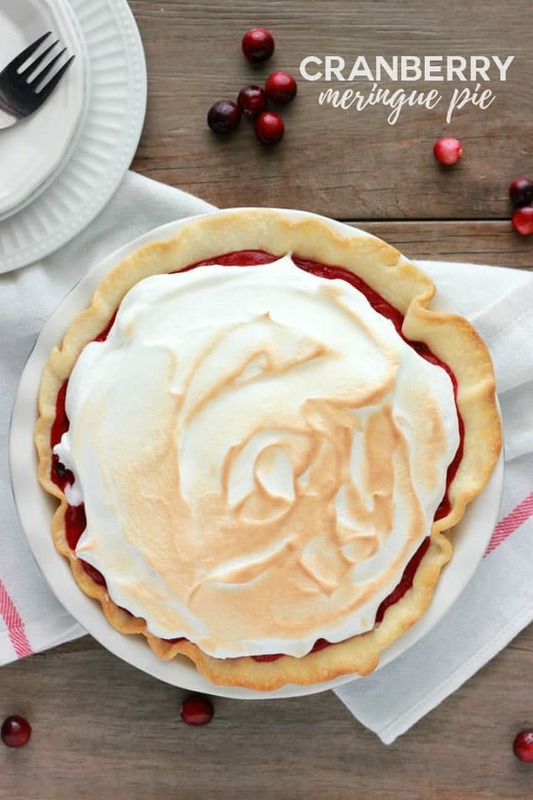 Let’s up our pie game with this delicious twist on a classic! 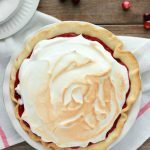 Slightly tart cranberry filling is topped with a toasted meringue for the perfect dessert recipe! Show of hands, who has an obsession with beautiful cookbooks? I found this book while browsing the all-mighty Amazong and new it needed to be on my bookshelf. A quick flip through and I had marked about 30 different pies I needed to make. Can we take a second to appreciate the beauty of the fresh fruit pictured above? How about some tips and tricks before we get started? I know I can always use a few helpful suggestions when it comes to pie crust. Handle the dough as little as possible. You want the butter to stay cold. This is what helps create that beautiful flaky crust. Use chilled ingredients. Cold butter. I’ll repeat. You want COLD butter. I recommend using chilled ingredients and refrigerating after each step in the crust making process. Use foil or a pie shield. The crust around the edges will likely burn before your filling has set. The simple solution is to create a shield around the crust while it bakes. Another option? Grab this crust shield from Amazon! Oh, and did I mention I gave video another try? It’s still a work in progress but I’m sure they’ll get better the more I practice. Like this recipe? You will love my Caramel Apple Pie, Classic Pumpkin Pie, and Mexican Chocolate Pie! Combine the water and 1 cup of sugar in a heavy bottom saucepan and cook on high heat until the sugar is dissolved. Stir in the cranberries and orange liquor. Lower the heat to medium and cook 10 minutes making sure to stir occasionally. 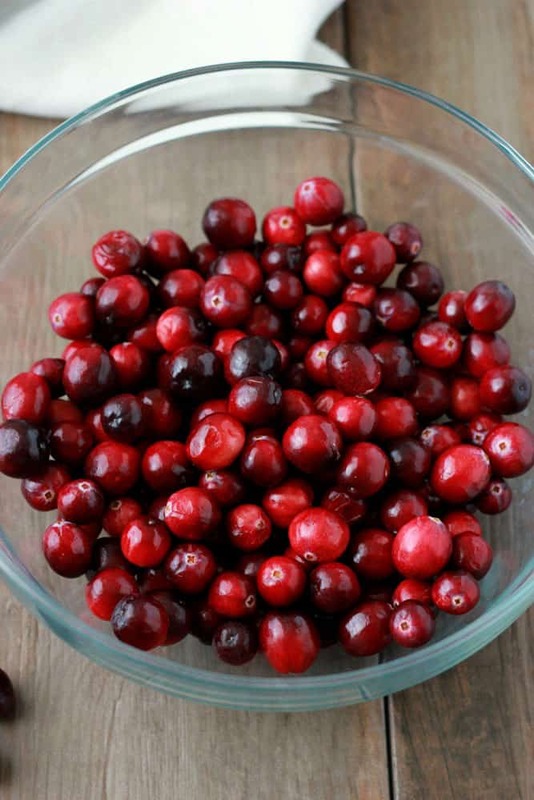 While your cranberries are cooking down, combine the egg yolks, cornstarch, and salt in a small bowl. Whisk until smooth. Stir in a small amount of the hot cranberry mixture making sure to mix quickly to temper the eggs. Add the yolk mixture to the saucepan and simmer 5 minutes or until the filling has thickened. Stir in the vanilla extract and butter and transfer to your pie crust. In a mixing bowl whisk the egg yolks and cream of tartar until foamy. Add the sugar and continue to beat until stiff peaks form. Spread over your pie and broil until the top is browned.